Here's some of the different custom gauntlets we've created over the years. 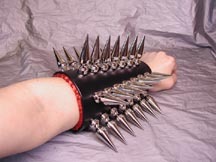 We can make any kind of spiked gauntlet to fit your needs. Email us mail@axovus.com for a quote.